The Halo franchise is no stranger to spinoffs. Nearly half of the Halo games fall outside the core series, and it looks like we could be seeing another addition to that list soon. Observant gamers discovered a listing for a game called Bootcamp on the Korean Game Rating Board, to be produced by Microsoft Korea. The translated description of the game ties it to the Halo IP, but aside from that there's quite a bit of guesswork going on. One thing is known, though: Microsoft has confirmed that more information on Bootcamp will be coming very soon. "What's Bootcamp?" reads a statement from a Microsoft spokesperson. "It is not related to our Xbox One efforts, or the Reclaimer Saga, but rather a project we're very enthusiastic about and will have more to say about in the near future." It's not much in the way of details, but the statement does narrow things down enough to make some educated guesses. Bootcamp won't be part of the Reclaimer Saga (the new trilogy that began with Halo 4), so odds are good that it's either a prequel of some kind or directly tied to the original trilogy. Another point of interest is the fact that Bootcamp is rated as a PC/Online title, with no mention of consoles from this generation or the next. Halo games have been ported to PC in the past, but there's never been a PC exclusive entry to the series. Naturally, theories abound. We could finally be seeing a PC port of Halo 3, potentially packaging the spinoff shooters under the new name, but don't count on it. Although the description of Bootcamp called out Halo 3 by name under Google Translate, other translation services say that the "3" is actually an indication that Bootcamp is a third-person shooter - a big change for the series, if true. 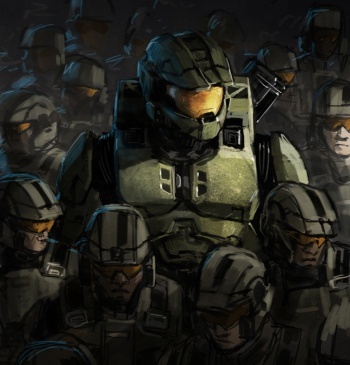 There may also be something in the name: the novel Halo: Fall of Reach: Boot Camp explored the origins of Master Chief before he became the power armored super-soldier we know him as today. It's possible that we could be visiting Chief's past in that context. Anything I can think of this early is little more than speculation. Microsoft did promise that more information is coming "in the near future," so I'd put my money on an official debut at E3 early next month.